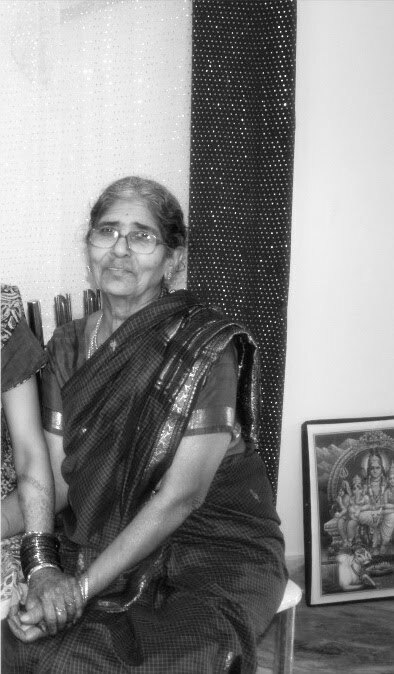 I call my grand mom - "Amma" (Mom), as she raised me till I was 4 years old. Once I started schooling, every summer, me and my sister used to spend all our time at their house - climbing guava trees, playing in the mud, making clay idols, plucking flowers, eating all goodies ...the list goes on. Ah! those were some of the best, care-free days of my life, where I didn't have any assignments to complete or any deadlines to meet. Life was at its best and since then, things have changed a lot back home. We all grew up and all those days, which will never come back are permanently etched as my memories. Eggplant sauteed in minced Ginger and Chilli is one of the classic dishes that is regularly made in Andhra households. My mom and my grandmom are experts in such authentic recipes and am trying my best to re-create their magic in my kitchen. This recipe in particular is very close to my heart as I remember my ammamma (grandmom) feeding us all with hot rice and a big dollop of ghee with appadams on the side. Note: Run through your knife to very finely mince the chillies and ginger together or use a mortel & a pestle (like my grand mom used to do) to coarsely grind it. don't puree. 1. Cut the eggplant, lengthwise into small pieces. Put them in lightly salted water, so that they don't change color. 2. Coarsely mince ginger and chillies together. Heat oil in a skillet and add urad dal, mustard seeds and cumin seeds. Once the mustard starts to pop, add hing and ginger-chilli mixture. Saute for 1-2 mins. 3. Drain the water from eggplants, pat them dry. Add them to the skillet. Mix everything so that the eggplants are coated with ginger-chilli mixture. Fill a plate or a vessel (which fits the skillet) with water and cover the skillet. Reduce the heat to medium-low. Cook for 6-7 minutes or until eggplants are half-cooked. stirring one or two times in the middle. Season with salt and turmeric. Cook for 8-9 minutes more or until the eggplant is fully cooked. Serve. Variations - Substitute eggplant with boiled plantain, cabbage or any bland vegetable. It will taste equally yummy. hey dear......lovely n simple stirfry...looks delcious.....and yes hope u got my other entries for mlla25.. I too call my grandmom as amma, as she raised me. Ur Grandmom looks Sweet.. This dish is new to me. Will try to slice brinjals like u have did, next time. Grandmas are the best!! Nice recipe Siri. There are so many Andhra dishes made with eggplants! Mouthwatering recipe dear! Loooove vankaya with allam.. Simple, yet so much flavor.. Thank you ladies for your sweet words. Beautiful post Siri, grandmas are always best..Delicious dish.. I too have fond memories of staying with my grandparents in summer.And yes Siri,even if we want to we can never get those days back. ammuma are true form of love, I love mine too and your post made me miss my grandmom even more. I prepare it the same way but also add tons of corriander I love eggplant in any form or shape. This is a lovely recipe Siri. I have been talking about my grandparents in the last 2 posts. Still I got lots to share. I think they were the best days. I am not lucky enough to be with my granny.